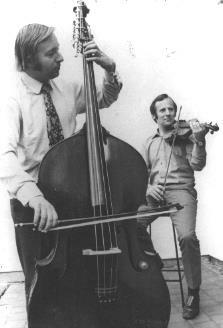 Founded in 1977 by Peter Georgiadis, who had been principal double-bass with many orchestras, Gallery Strings was specifically set up as an instrument dealership for professional musicians. Having been brought up in a very musical environment, with an elder brother John who was the youngest ever concertmaster of the "London Symphony Orchestra", it was no surprise that Peter would eventually become interested in knowing more about the instruments which had so often surrounded him, and in 1977 he decided to stop playing and become a dealer. His invaluable experience as a player became a great attribute, as he could offer advice on instrument selection to colleagues, one professional to another. Over the last twenty years Gallery Strings has supplied double-basses to many orchestras from all continents of the world. Gallery Strings has also supplied fine instruments to some of the worlds greatest Jazz musicians. The good reputation earned from these many years of service to the double-bass community of the world, does not mean that the company has not also been involved with the other members of the string family. There has in fact been a steady growth, over the years, in business with violins, violas and cellos, as well as a lively trade in all bows, but this area of operations has now been enhanced by the new arrival of brother John at Gallery Strings, who will concentrate primarily in these fields. With past sales averaging around one hundred quality double-basses per year, Gallery Strings intends to remain at the forefront of instrument dealership and continue to keep prices competitive, so please contact us to find out what we have in stock. In the picture on the left you can see both brothers in action. Peter is here playing a very fine George Lotte double bass made in Mirecourt, France c1880. A very fine sounding orchestral instrument. This bass did not have that typical French nasal tones, but rather more refined quality. This instrument was sold to the Baltimore Symphony Orchestra. John is playing a fantastic Joannes Baptista Guadagnini violin, made in Milan, Italy c1750. John was playing this violin when he was leading the London Symphony Orchestra. This photograph was taken in 1970 by a local newspaper who was writing an article on the two brothers working Worlds apart. Sadly, thirty years on we both look thirty years on, but are no longer Worlds apart working very closely with instruments in Gallery Strings.